Lower GI bleeding (LGIB) is defined as bleeding arising from a source distal to the ligament of Treitz, with the resultant potential for rapid hemodynamic instability. Physical signs of hemodynamic compromise include orthostatic hypotension, fatigue, pallor, palpitations, chest pain, dyspnea, tachypnea, and tachycardia. Hemodynamic stabilization through large-bore IV fluid resuscitation should be initiated immediately if acute LGIB is suspected, and blood transfusion may be necessary. Laboratory testing should include CBC, comprehensive panel, coagulation profile, iron studies including transferrin saturation, and reticulocyte count (before transfusion), and blood type and crossmatch. Clotting disorders and anticoagulant use, including daily aspirin or NSAIDs, should be identified during history taking. Figures 38-26 and 38-27 provide a detailed algorithm for the workup of LGIB. The American Society for Gastrointestinal Endoscopy Standards of Practice Committee recommends colonoscopy as the preferred modality for the evaluation and treatment of LGIB, allowing for direct visualization of the source of bleeding in over 70% of cases, as well as therapeutic intervention and tissue biopsy. Table 38-4 lists the frequency of the most common causes of LGIB. 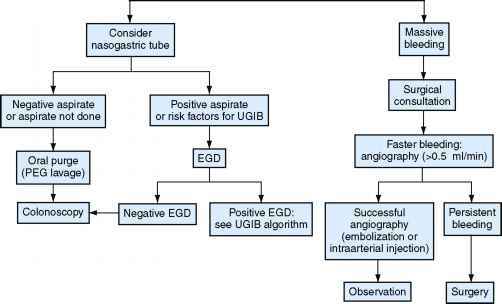 When no obvious colonic source of bleeding is discovered on lower endos-copy, upper endoscopy is done to evaluate potential causes of rapid, significant UGIB interpreted as LGIB. If there is still no identifiable source of bleeding, examination of the small intestine using enteroclysis or capsule endoscopy should be considered. Intubation of the terminal ileum at the time of colonoscopy may be useful, particularly when there is blood throughout the colon; fresh blood emanating from the ileum indicates small intestinal bleeding (Eisen et al., 2001). The combination of an overall higher diagnostic yield and a lower rate of complications makes colonoscopy the preferred choice over angiography as the initial test in most patients with suspected GI bleeding. Colonoscopy may be performed urgently or electively, depending on the patient's hemodynamic status and risk-stratification criteria. Comor-bid risk factors for GI bleeding severity, including advanced age, presence or absence of shock, congestive heart failure (CHF), ischemic heart disease, and stigmata of recent hemorrhage, accurately predict the likelihood of death or rebleeding (Rockall et al., 1996). In patients with LGIB who are hemo-dynamically stable, a clean-out preparation (e.g., GoLytely) should be used before colonoscopy to increase visibility and diagnostic yield. In patients with hematochezia and hemo-dynamic compromise, consideration should be given to a rapidly bleeding upper GI source, the patient should be kept NPO, and a nasogastric tube should be placed. A bloody aspirate or one without blood or bile, a history of NSAID use or previous PUD, or a patient with massive bleeding may prompt performance of upper endoscopy before evaluation of the colon (Eisen et al., 2001). The 99mTc pertechnetate-labeled red blood cell (RBC) scan is a safe and noninvasive alternative to angiography. Slower rates of bleeding may be detected with this technique, but it is not as accurate in identifying the exact location of a bleeding site. When arteriography is used in association with a 99mTc-tagged RBC blush, the sensitivity of the arteriogram is increased to 61 to 72% (Zuckerman et al., 2000). 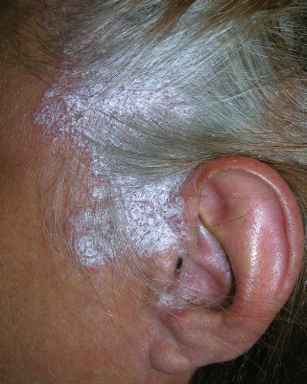 A retrospective study using these scans showed that an "immediate blush" (positive scan) had 60% predictive value for an associated positive angiogram, and a "delayed blush" correlated with 93% predictive value for a negative angiogram. exploration. Directed segmental resection is advised when the bleeding site is identified preoperatively, as seen in adenocarcinoma of the colon or diverticular disease limited to the left colon with persistent or recurrent bleeding. The removal of identified colonic lesions does not always result in effective treatment of the underlying source of bleeding. In these cases, arteriography can be used intra-operatively as an adjunct to localize a source of bleeding, facilitate segmental resection of the bowel, and prevent "blind hemicolectomy" (Manning-Dimmitt et al., 2005). A transfusion requirement of greater than 4 units of packed RBCs in 24 hours and recurrent diverticular bleeding (seen in up to 30% of patients) are common indications for surgical intervention. Other factors, such as comorbidities and individual surgical practices, play a significant role in this decision (Eisen et al., 2001). In patients with chronic intermittent rectal bleeding, upper endoscopy is the preferred test for evaluation, with sensitivity and specificity of 92% and 100%, respectively. A barium-contrast upper GI series with small bowel follow-through (SBFT) may be considered if there is a relative contraindication to endoscopy (e.g., anticoagulation therapy, high risk for complications with conscious sedation, endos-copist unavailable). This test has sensitivity and specificity of 54% and 91% in the detection of upper GI lesions located above the ligament of Treitz (Zuckerman et al., 2000). Transcatheter embolization is an alternative when vasopres-sin is unsuccessful or contraindicated, but carries a risk of acute abdominal pain and intestinal infarction (Eisen et al., 2001). 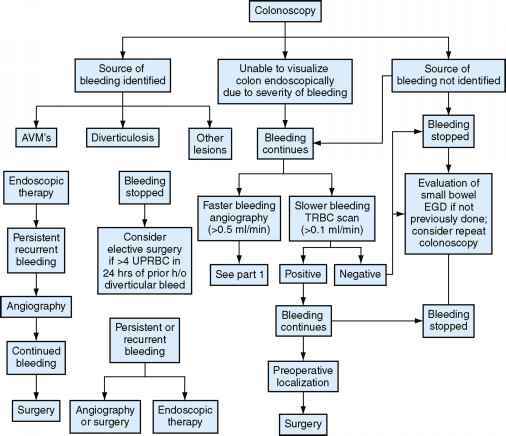 enteroscopy should be considered a "last resort" in the diagnostic evaluation of nonemergent cases of GI bleeding because it is associated with higher rates of morbidity and mortality (Zuckerman et al., 2000).